This pattern is available from ravelry.com for $9.95. This pattern is part of the PDF book “Knitted Numbers 101: 10 easy-to-knit Plush Toy Patterns,” which includes numbers zero through nine as well as a stitch glossary and finishing instructions. These numbers are designed for learning as well as for fun! Each one is decked out in its corresponding number of sporty stripes. The stripes on the odd numbers have been knitted in one color and even numbers in another. Of course, if you don’t like changing yarn colors to knit stripes, you can simply knit your set of numbers as solids. Feel free to “knoodle” with your numbers and get creative! Stitch eyes on your finished plushies and add yarn hair, like I did with my alphabet plushies. Instead of stripes, embroider a corresponding number of asterisks or other symbols. Make fronts and backs different colors to de-stash! 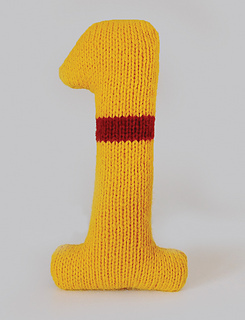 Each number is knitted as two flat pieces and then sewn together using a mattress stitch. When you are finished knitting them, using the recommended materials, your number plushies will be approximately 9” (23cm) tall.